Fished with Andy M. on his 23′ Everglades today. We fished the incoming tide using Herring, Squid, Mackerel, and Minnows. Herring and Minnow in combination were the hot bait. The incoming tide against the Southerly breeze made for perfect drifts along the sod banks. Andy used a 3 way swivel with a teaser hook on one and a white bucktail on the other. I used my top/bottom rig with a teaser on top and a Flukeball on the bottom. Drifts were slow and productive. 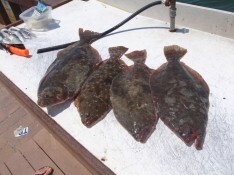 We ended up catching 7 Flounder on the day: 16″, 17″, 17.5″, 18″, 18.5″, 21: and 22″. The 22″er was tossed back due to having a serious sore on it’s dark side. The skin was gone, and the flesh looked red and puffy. The tail also had rot spots along it, like it was burned. Thinking it was micobacteriosis. Thinking now we should’ve kept it to get it out of the water and away from other fish. Ick fish aside, we had a great day! I run guided fishing trips in the waters of Cape May County, NJ by boat or from land. 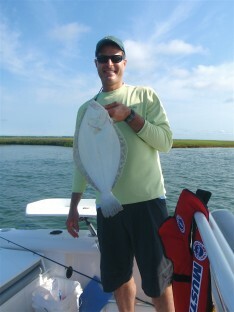 By boat I fish the back bays, ocean, and Delaware Bay with 1-3 anglers onboard. I will also take any number of anglers out onto the beach to surf fish, or out and about in the back bays to fish the sod banks and other structure. Families and children are always welcome! My company motto is: We Go Where The Fish Are!